The automation of Virtual Sound Check mode with Capture requires the Capture Sync connection, and Capture Sync capability is currently not available with the RM series mixers. Capture Sync capabilities will be implemented in a future update of Capture. The current workaround for Virtual Sound Check is to manually enable firewire inputs. 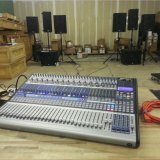 Can I use an RM Mixer to record with any DAW?